Here come the babies! Look below for this year’s new arrivals that have been added to the herd. 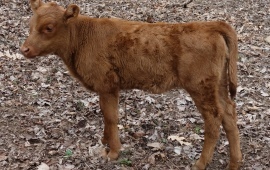 Click on any calf’s picture or name to see more information. PLEASE NOTE: The calves pictured below are NOT available for purchase. Please see the ‘Sale Barn’ page to find my stock for sale. Expected Arrivals for 2019: Here’s a list of who’s bred to whom for the upcoming calving season.